Use storytelling and playacting to draw early elementary students into the study of history. Since starting my career teaching in inner-city elementary schools in London, I have always been struck by how many students report that history is their favorite subject. Why do children love history? My theory is that the subject contains remarkable stories from times long ago that engage children’s imaginations and that are also true. Young children can’t handle big history topics. To access history, young children need to start small and in the real world, perhaps by looking at toys. Getting the dates right is the most important part. History can be overwhelming, given its vast scope. Like any subject, it helps enormously if you have a personal passion for it. There is a danger with any subject that if it intimidates teachers, they may inadvertently simplify or reduce the content to make it more manageable. Teachers don’t want to do this, so how can we approach history lessons in a different way? For the past two years, my wife, Jill, has taught a historical unit of inquiry in first grade, exploring different objects and their stories. She encouraged her students to study the biggest possible history topics: dinosaurs, human evolution, ancient Egyptians, Romans, the development of trains, etc. Here is the big thing we’ve learned by letting the students choose what they’ll study: They are naturally curious and fascinated by history on the grandest scale. How can first-grade students possibly understand the depth of content of such topics? How can they remember the names and dates? 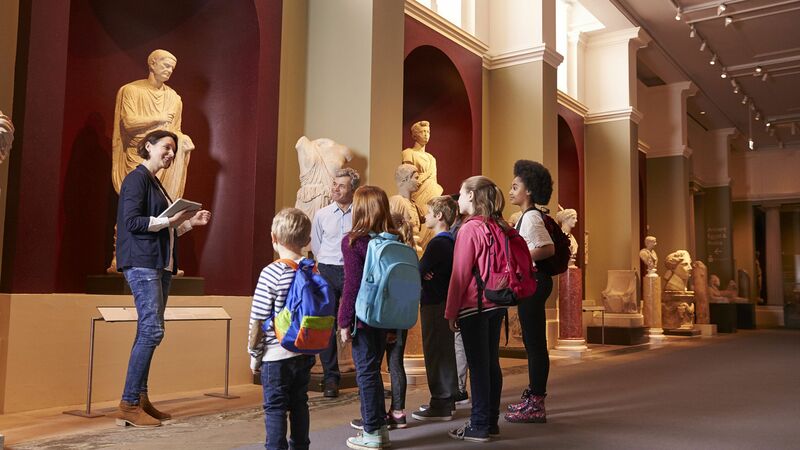 Admittedly, they may not—but the underlying reason to teach these topics is to infuse young children with a love for history. As they grow and develop, they will be able to understand more content, sequence more events, memorize more dates—but still love history. Storytelling is a wonderful way to bring history alive for all students. I know high school history teachers who hook teenagers with salacious and shocking stories before delving into the task of assessing sources. For younger students, I tell a story from history and have them act it out at the same time, bringing a kinesthetic element to the process. History is fundamentally a human act of storytelling—story is conveniently part of the word. What hooks children? The same thing that hooks adults: the dramatic stories, incredible events, and captivating characters from the past. This year, stories that have captivated my wife’s students have ranged from dinosaurs to Hippocrates, the destruction of Pompeii to life in medieval castles. One of my favorite stories to tell is the evolution of life, including the story of human evolution—connecting history and science. I have to spend a little while refreshing my knowledge of the sequence of events, and I have notes that I use if my memory fails me. Children don’t care if you have to refer to your notes—they just love the stories. Straight after storytelling, try having the children sit and retell the story. This strengthens a key reading skill, and also connects history with speaking and listening skills. This in turn deepens their sense of historical progress and connection. Use their ideas and also include key moments in history you want them to know. Use pictures with students of all ages. Have the time line grow around the classroom. For older students, use math skills to make the links proportional—e.g., 1 yard = 300 years. Keep the time line up and refer to it for the rest of the year. As students get older, studying history naturally entails more skills and complexity. But if we don’t capture the students’ initial enthusiasm for the subject, we’ll struggle with the teaching for years after, producing adults who are uninterested in or intimidated by the subject. To paraphrase Confucius, we must study the past to define the future. Teaching history in the grandest and most engaging way today could help your students love history long into the future.